So I was pretty surprised to see this limited edition (?) Kit Kat Chunky Peanut Butter staring back at me from the aisle in Shoppers Drug Mart this past weekend. I don't think I've ever heard of a Kit Kat Peanut Butter before. And while I know I haven't reviewed it yet on the Candy Aisle, I am a MASSIVE fan of the Chunky line. So needless to say this is very exciting. To add to the interesting it looks like Nestlé Canada is (or was) having a little vote on their Facebook page - the Kit Kat Chunky Challenge page linked here. You see they actually released two variants on the Chunky bars just before Easter: Peanut Butter and a Hazlenut. Then people were challenged to vote on the best tasting one, presumably that one would stick around while the other went away. Unfortunately thats not how things worked out. Now I know I'm late to the game on this, but seriously this isn't a candy news blog. The thing is hat there were several reports of people finding bits of plastic in their new Kit Kat Chunky bars.... I know, gross. According to reports the Canadian Food Inspection Agency issued a warning to consumers, and then Nestlé voluntarily had the products recalled. I believe this affected other countries but I'm finding it hard to confirm that. According to The Grocer blog (which is a very good food and candy news blog btw) Nestlé also recalled some Easter Eggs, and Chunky bars in Chocolate Fudge and Caramel varieties (although I don't know if those variants were sold here in Canada). Not to worry though my intrepid Kit Kat lovers, check out the page linked here to see the affected product lines and make sure you cross check you next Kit Kat Chunky before eating. I'm pretty sure all the big chain stores would have gotten rid of the bad product by now, but better safe than sorry right. 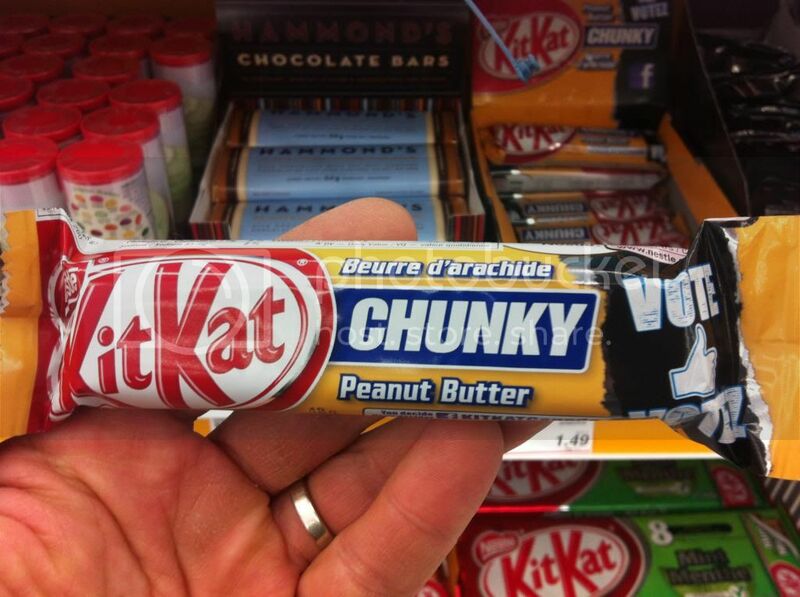 I definitely would like to try a Kit Kat Peanut Butter, but now I'm a bit nervous. I'll have to make sure the best before dates on it are new before getting one... and even then I expect I'll be a bit squeamish. Its a shame when things like this happen, but at least Nestlé stepped up and did the right thing. Dropping the Mits... for Candy!